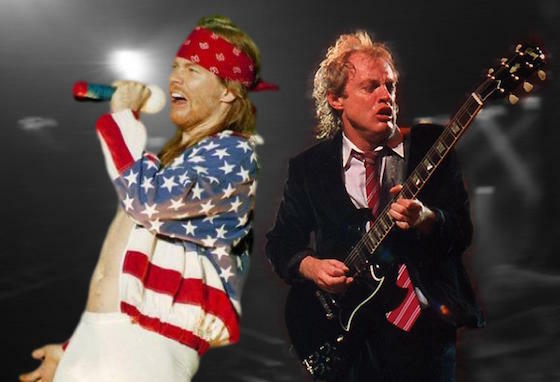 If you didn't manage to catch the Axl Rose-fronted AC/DC on their recent "Rock or Bust" tour, you may be able to enjoy a performance from the rock vets from the comfort of your living room with a forthcoming concert film. Alternative Nation reports that the band's final tour stop in Philadelphia on Tuesday (September 20) was shot professionally for an upcoming release. A filming release at the concert reportedly stated that "the recording may be released in theatrical, broadcast television, home video and/or any and all media." The final show also marked the departure of bassist Cliff Williams, who announced his retirement in a video note the same day. His retirement comes after rhythm guitarist Malcolm Young's departure due to dementia, the exit of drummer Phil Rudd due to charges related to a murder plot and drug possession, and the departure of longtime vocalist Brian Johnson. While the release timeline has yet to be determined, you can be sure Axl will be vetting the footage heavily to make sure he was shot at all the correct angles.